During my adolescent years, an endless supply of sanitary pads 'magically' appeared in my toiletry cupboard. I had never thought of such things as luxury, but essential and not optional, oblivious to the reality that some school girls from underprivileged backgrounds miss school for weeks at a time when menstruating. Thanks to campaigns that have increased awareness and support for these girls, I did not realise the extent of this or what it means exactly, until receiving a desk drop from Joe Public United of some of the unsanitary, unhygienic and unabsorbant alternatives that are used, such as leaves, newspaper and sand. 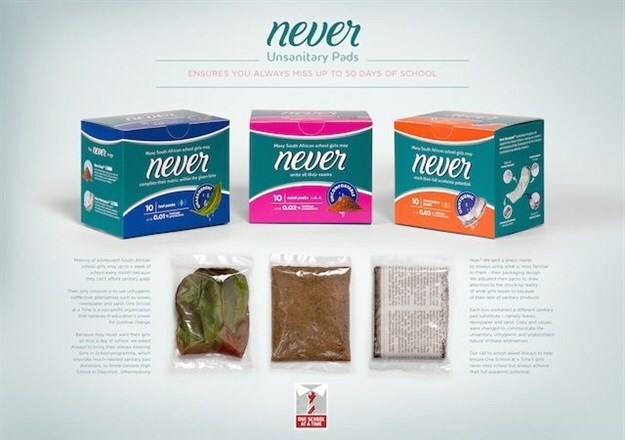 In an effort to help ensure girls never miss school and always achieve their academic potential, Joe Public United sent Always a direct mailer and packs of the above-mentioned substitutes of 'unsanitary pads', using Always’ packaging design, except labelled as ‘Never’. 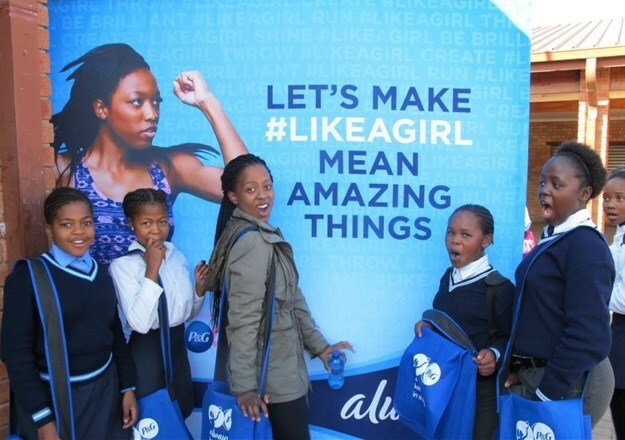 In the mailer, Joe Public asked them to take their Always Keeping Girls in School programme to One School at a Time’s (OSAAT’s) Itirele-Zenzele High School in Diepsloot. In case you don't know, OSAAT is a small registered non-profit organisation that believes that education is the solution for socio-economic change, and girls missing school because of lack of access to sanitary pads is just one challenge it seeks to tackle ("like a girl" of course). Always responded by not only taking their programme to the school, but also adding them to the list of schools they visit every year, and ultimately instilling confidence in a greater community of girls when it comes to their periods. As a very small NGO, we needed to appeal to a big brand in a hard-hitting, compelling way that would get their immediate attention. The idea came from the insight that it is often difficult for people who have access to sanitary pads to imagine this a reality without them. Which is why we decided to create packaging to demonstrate what sanitary wear looks like to these girls who can’t afford it. The direct mailer used what is most familiar to Always – their own packaging design. We adjusted their packs to draw attention to the shocking reality of what these girls have to resort to as sanitary wear. Each box contained a different sanitary pad substitute – namely leaves, newspaper and sand. Copy and visuals were changed to communicate the ineffective nature of these alternatives. Our call to action asked Always to help ensure our girls never miss school but always achieve their full academic potential. Comment on your work with OSAAT and Always. With empowerment through education being an important pillar for both brands, connecting OSAAT with Always was a natural fit. The direct mailer achieved exactly what it set out to. It grabbed Always’ attention to bring their Always Keeping Girls in School programme to OSAAT that provided a much-needed donation of sanitary pads and empowering educational resources and talks on puberty. Not only did we succeed in this, but Always has also added Itirele-Zenzele to the list of schools they visit annually. The girls commented on the positive impact the sanitary pad donation and empowering, educational talks had and that they realise their school attendance and confidence doesn’t have to be affected by this normal biological process. We would like to create further awareness of this issue by people in the media sharing this creative execution and the public becoming aware of the issue it speaks to. It serves as a disturbing, yet eye-opening piece of communication and opens the opportunity for people to not only donate sanitary pads to OSAAT, but to hundreds of other schools in our country who need it as well. , MD at OSAAT, to discuss ways to get involved.